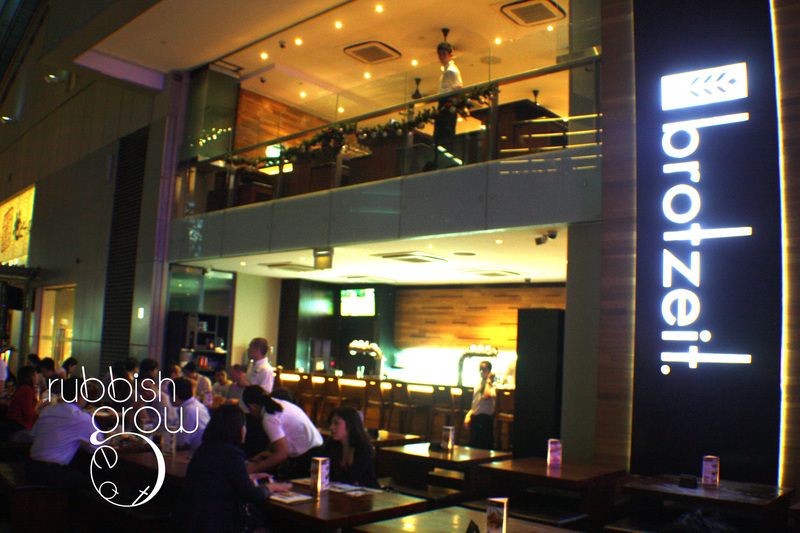 Two new friends, Mr NGFL and I got down to Brotzeit to try their Game Menu for Christmas, till 31 Dec only. What is game? Not computer game ok?? In movies or books, the aristocrats will gather at someone’s huge mansion, and they will go hunting in the forest. Any animal that is hunted in the wild is called game. It can range from fowl to beasts. Then the aristocrats get the cooks to prepare the game for dinner–it gives the aristocrats the illusion they are working for their own food. 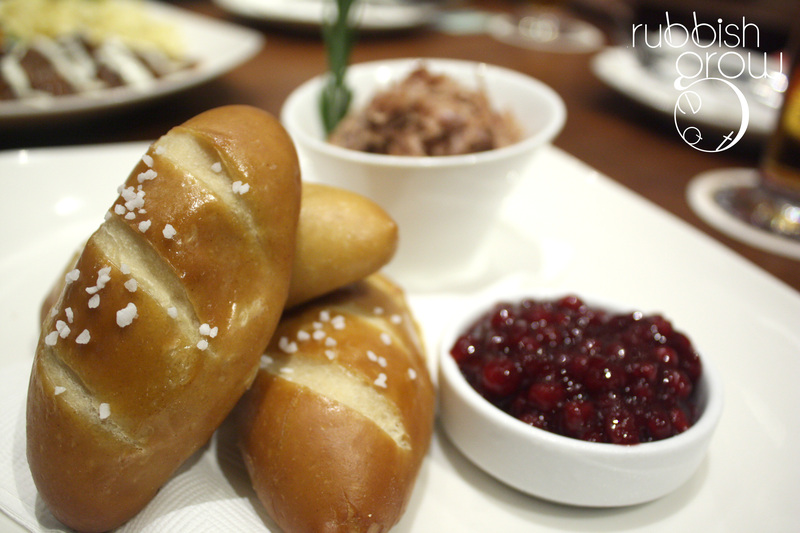 “Brot” means “bread” and “zeit” means “time” and together, it means a homely meal with beer. Haha, you think it’s “bread time” right?? We argued over some time how to pronounce it. “Zeit” is definitely pronounced as “tsahyt” as in the English word “zeitgeist.” And since I write this blog, I decided to pronounce “bro-tsahyt.” Yo, for the bros, man! 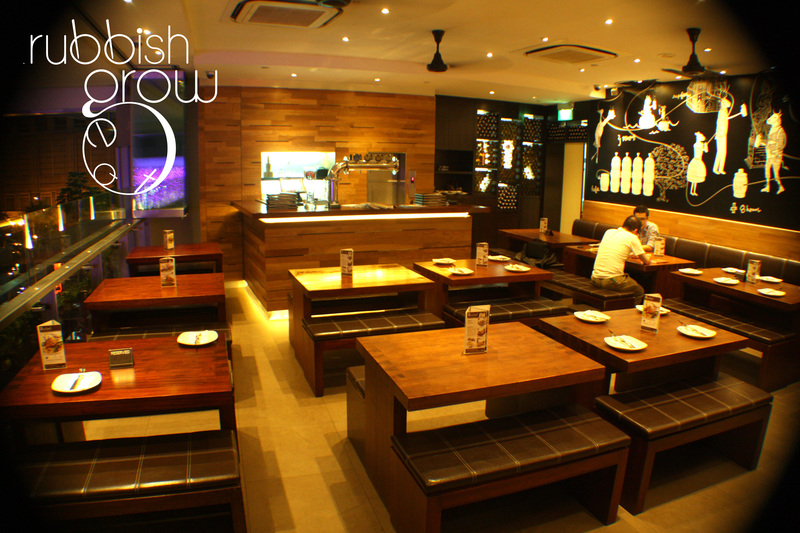 Despite that the restaurant-bar is huge, spanning two storeys, it gives a very cozy and intimate ambience. I love how funky the murals are: Animals found in Germany are in the process of brewing beer in Singapore, signaled by iconic Singapore buildings. The lightning is yellowish, which is how all restaurants’ lighting should be. 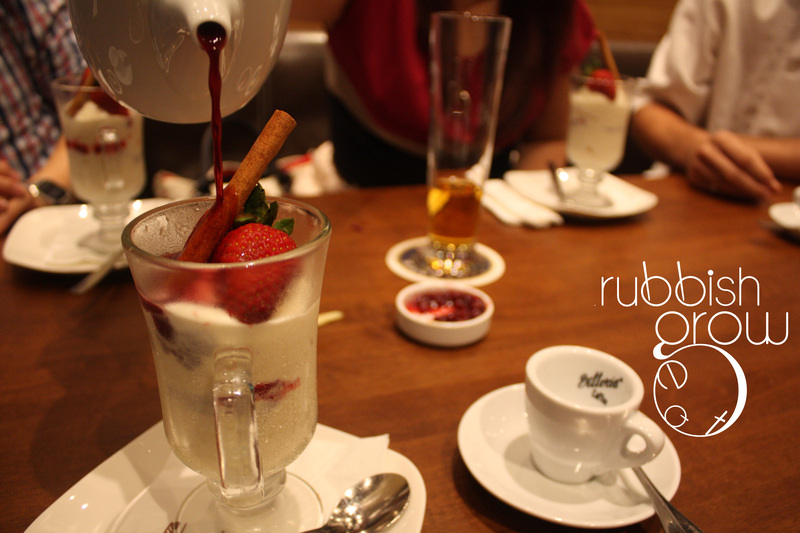 It’s definitely a good after-work place or just hangout with friends. For starters, we had the pretzels and, from the game menu, the duck confit with cranberry sauce and Brezn sticks ($18.50). 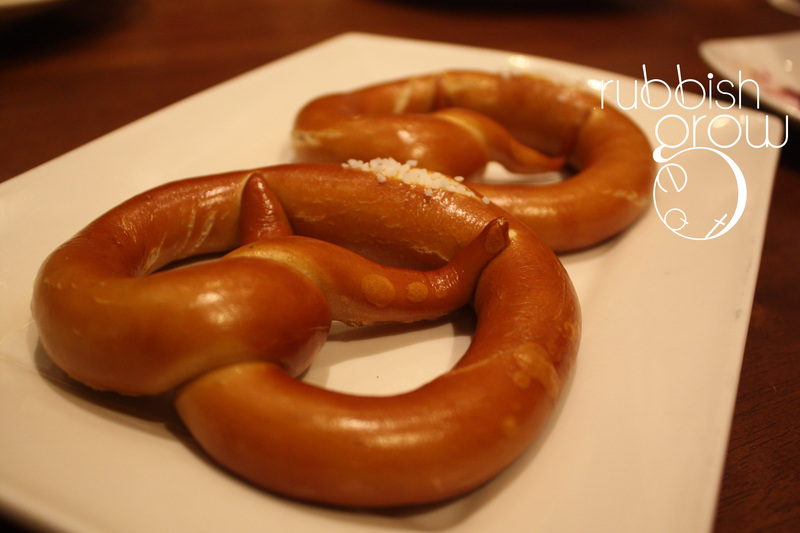 Brezn stick is baguette form of pretzels, which is white bread treated in an alkali solution, according to Chef Claus, the executive chef of Brotzeit. The duck confit took 18 painstaking hours to prepare and cook. I usually dislike duck confit–don’t like overly salty things–but if you stuff the salty shredded duck and sweet berry-ish but not tart cranberry into the bread, the mixture of the taste, a little bit of everything, titillates the tongue. 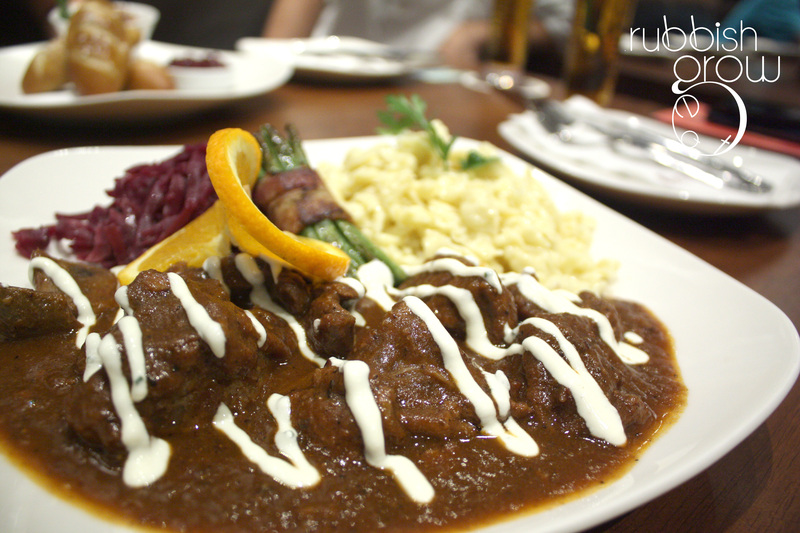 Although the starters were good, I’d say, go for the mains because Brotzeit gives a very generous serving of mains. We four only ordered two mains because of the starter. I think next time I go, I’ll just kill on the mains and eat one entire plate on my own. From the Game Menu, there is a choice of roast or stew and we picked one from each. Wildragout ($38.50), as in Wild-ragout and not wil-drag-out Drag Queen Kumar style, is deer and wild boar stewed till tender with onions, bacon, juniper berries, finished with sour cream. My new friend asked if I could distinguish between the deer and wild boar. So proud of myself, I can!!! The deer is very tender, and comes out in shreds in your mouth, and has a very, very distinct smokey aroma, like it has been on the charcoal grill for some time. The deer was truly delicious. Next time I come, I want to ask them if I can have a plate of just deer because I’m a dear. The dish also comes with red cabbage that takes 24 hours to prepare and tasted like the Chinese salted vegetables; buttered Spatzle, a seasoned dough poached in boiling water, that tasted like mee hoon kueh; and fine beans wrapped in a piece of bacon. 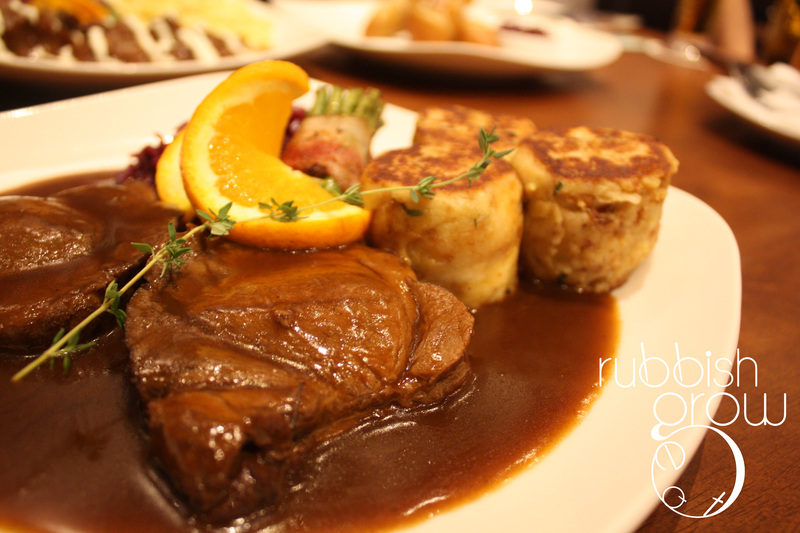 We didn’t like wildschweinbraten ($34.50), roast wild boar, so much. We know the dish is well cooked but it’s just that we’re not used to the toughness of the meat. Wild boars and Babe (farm pig) are very different. Babe gets fed, becomes fat, and fats give meat the tenderness–that’s why I’m so tender. But to survive in the wild, boars are muscular and have tight hides, so that’s why the meat is tough. So now you know those gym bunnies are wild savage pigs and I’m the tender precious prince in the pen. However, the sides were AWESOME. I can’t stop eating the napkin dumplings! It’s white bread treated with paisley and spices and boiled in a napkin. It tasted like mashed potato salad with black pepper. I love potato salad! This dish also has red cabbage and fine beans wrapped in a piece of bacon. We each had a Gluhwein ($14.50), pronounced as “gluen,” which is Xmas seasoned hot red wine served with vanilla ice cream and strawberries and the Heisser Gluhwein ($12.50) itself, which is hot red wine. This truly, truly reminds me of Christmas. When I was at the Ah Beng Boot Camp in New York, the weather was freezing, minus ten degrees. And at Union Square Farmers Market, I bought this hot red wine, and it felt so warm inside despite the freeze. Ice cream is also very winter-ly. It actually feels very good eating ice cream in winter. So Gluhwein is really a great creation, with the sweetness of vanilla, the woody spice of cinnamon and sweetness of berry (both ingredients are very Xmasy), and aroma of the Xmas wine. I want to go back and eat more of this! I’ve eaten game fowl before, but not game-four-legs so the Game Menu is an eye-opener for me. (You can look at the menu here.) The entire experience feels very Christmassy – probably because the restaurant uses many Xmas ingredients, lots of berries, cinnamon, and a winter beer, Weihnachtsbier, a sweet, full-bodied lager that has a berry aftertaste. I think I’ll go back soon before the game meat menu is over. Two other outlets at Vivocity and Raffles City.